One of the UK’s Leading Suppliers of Food Labels! At Lotus Labels we cater for all sizes of businesses. Whether you want food labels to take a product to market, or have a farm shop and want to brighten up your products, we have a digital label printing solution to suit. 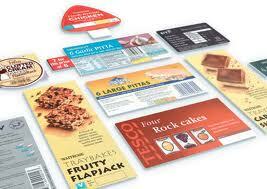 Digital label printing really suits the needs of customers when it comes to food labels. We have the ability to print various colours and substrates which add an extra depth to your labels and make them stand out on the shelf. With food labels the ability to print many sorts without the cost of films and plates associated with other formats, digital label printing helps keep the cost down. Another great example of being able to save money and have a quick turnaround is the ability to print variable data with little setup time. This fits in well with things such as sandwich labels where price and ingredients vary.